Defender Lewis Dunk is fine to play at Wolverhampton Wanderers tomorrow (5pm), after going off through illness in Albion's last two matches. 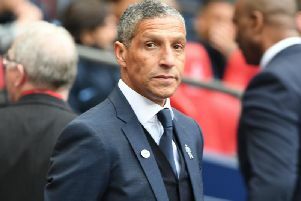 Dunk played 31 minutes in the 3-1 win against Birmingham and then went off at half-time in the 2-1 victory at Queens Park Rangers last Friday but Seagulls boss Chris Hughton said there is no problem now and he will be in the squad tomorrow. Striker Sam Baldock is taking a bit longer to recover from a glute injury than Albion initially thought and will miss the Wolves game. When asked if defender Shane Duffy could play again this season, after breaking a metatarsal in the 3-0 defeat at Nottingham Forest last month, Hughton: "It's been just over five weeks now and at this moment, he's still walking in a boot, so it will be touch and go."